In 1894, Baron de Coubertin, a French aristocrat, convened an international congress at the Sorbonne in Paris. His naïve goal was to end world military conflict by substituting a festival of sports patterned after the ancient Olympic Games. Political and economic problems arose immediately. France refused to attend the Sorbonne meetings if Germany was invited. Countries would find the cost of presenting the Games to be onerous. De Coubertin and his handpicked International Olympic Committee announced that the inaugural Olympic Games would take place in Athens in 1896 in recognition of the ancient Greek origins of the athletic festival; however, the prime minister of Greece, Charilaos Trikoupis, rejected the plan because the Games would bankrupt the Greek economy. As a result of the financial burden of the Games, Trikoupis was forced out of office by the country’s creditors. He died a week before the first Games began, as scheduled, in Athens. 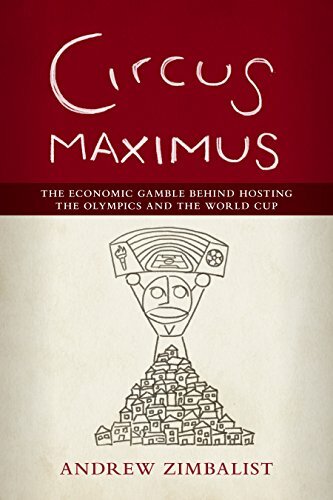 Professor Andrew Zimbalist’s new book, Circus Maximus, proves convincingly that the Greeks were prescient concerning the pecuniary implications of being honored with the designation of host of the Olympic Games. It was Zimbalist’s intention in Circus Maximus to write a short text (135 pages) accessible to non-economists. For the most part, he achieves that goal, examining the short-term and long-term economic impact of hosting these festivals. On occasion, Zimbalist slips into the jargon of economics, but as long as the reader avoids his scholarly endnotes, the arguments and data are set forth in an understandable fashion. Although most Olympic Games in the post-World War II years have crippled the balance sheets of the host cities, sometimes for decades as in the case of Montreal, Zimbalist identifies two significant exceptions: the Los Angeles Games of 1984, which were sold to commercial advertisers piece by piece; and the Barcelona Games of 1992, which were solidly based on a longstanding city renewal plan. Most recently, both the Olympics and the World Cup have enjoyed the largess of autocratic regimes where cost overruns appeared to have caused little public disturbance. The World Cup in Russia in 2018 and Qatar in 2022 will continue the trend of siting these events in locations where the populous will not even have the opportunity to disagree. The tab for Russia’s 2014 Sochi Winter Olympics— originally estimated at $12 billion, but likely to have cost $50–65 billion by the time the two-week sport festival began—is a perfect example of what has happened to de Coubertin’s dream. Why then would so many cities and countries seek to host these financially disastrous events? Zimbalist does not focus on the political benefits that accrue from hosting these sports festivals. They are difficult to monetize, and, as such, cannot outweigh potential deficits in the balance sheet. Most proponents of staging these events recognize the political benefits as a compelling reason why cities and states put up with the downside economic potential. To be “up close and personal,” as ABC used to brand its television coverage of the Olympics, the irresistible political value to the host cities must be recognized. Zimbalist’s book appears to be a direct warning to cities like Boston, which has been designated as the United States candidate city to host the 2024 Olympics. Although a charming and educated city, Boston must appreciate the economic risks as Zimbalist lays them out. The United States Olympic Committee found the Hub’s plan to use existing structures and private funding (except for the costs of security) to be worthy. The risks, of course, lie in the prospect of cost overruns. Here is where Professor Zimbalist might have a role to play. As the Robert A. Woods Professor of Economics at Smith College a hundred miles west of the Boston Common, Zimbalist could serve ably as an independent “ombudsman.” He could be charged with overseeing the bottom line to make sure that promises made are promises kept.